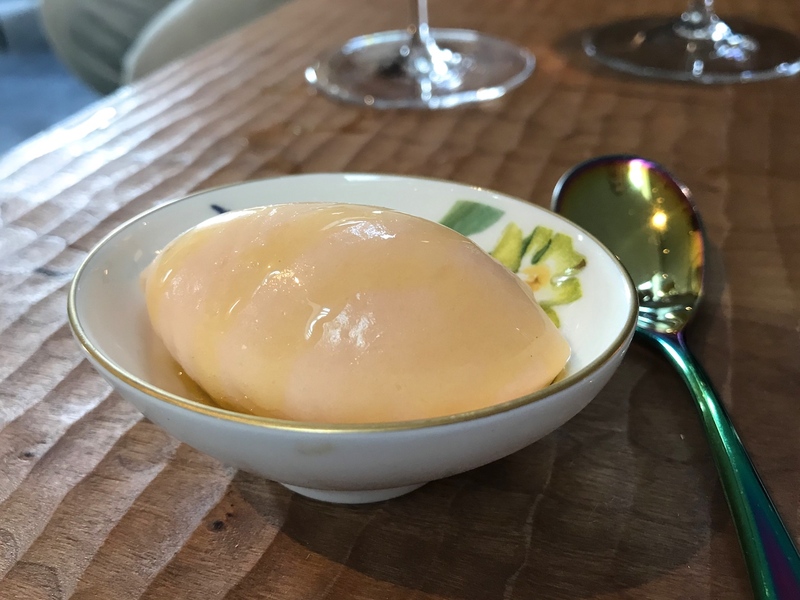 Frantzén originally started out as a collaboration between chef Björn Frantzén and his business partner and pastry chef Daniel Lindeberg in 2008, when they established restaurant Frantzén/Lindeberg in Gamla Stan, the old town of Stockholm. The restaurant experienced early acclaim from Michelin, collecting a Michelin star the following year. Perhaps no surprise, because the duo had trained in some of Europe's finest kitchens, including Raymond Blanc's Le Manoir Aux Quat'Saisons in Great Milton, Pied à Terre in London (during Tom Aikens' reign), and Björn even spent some time at Alain Passard's l'Arpège in Paris. In 2010 the restaurant was awarded its second Michelin star. The World's 50 caught up in 2012, when the restaurant entered the list at number 20, climbing to number 12 in the 2013 edition, which remains the restaurant's highest position to date. Daniel Lindeberg left the restaurant in 2013, the restaurant was renamed "Frantzén" and remained at its old town location for another three years. However charming this location was, it did have its limitations, so in 2016 Björn Frantzén decided to relocate to new, larger premises at Klara Norra kyrkogata, a side street of the busy shopping street Kungsgatan. The restaurant space has increased sixfold (the number of covers from 18 to 23), allowing the restaurant to offer a completely new dining experience (more about that later), and to use additional techniques in their cooking, like cooking over open fire (regulations prohibited the restaurant using open fire at their old location in the historic old town). 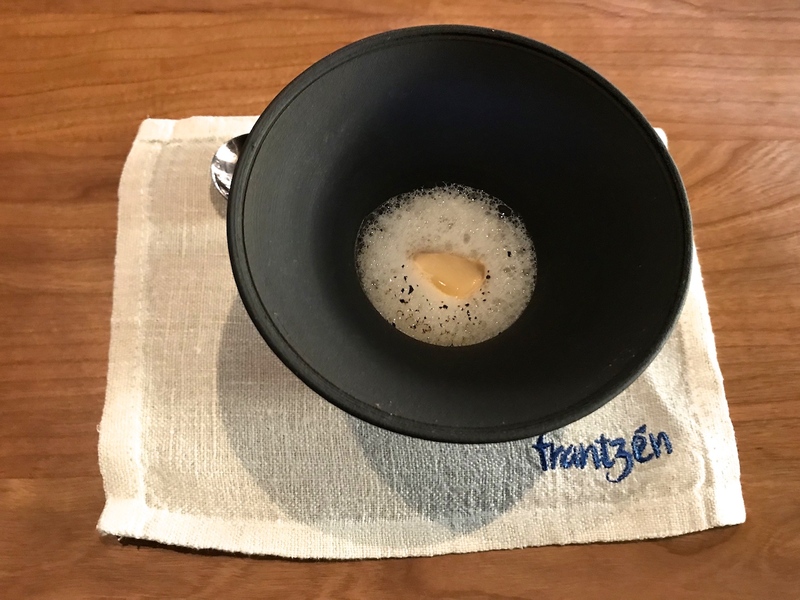 A smart move which paid off, because in February 2018, five months after the reopening, Frantzén was (finally) awarded a third Michelin star, making it Sweden's first three-star restaurant. 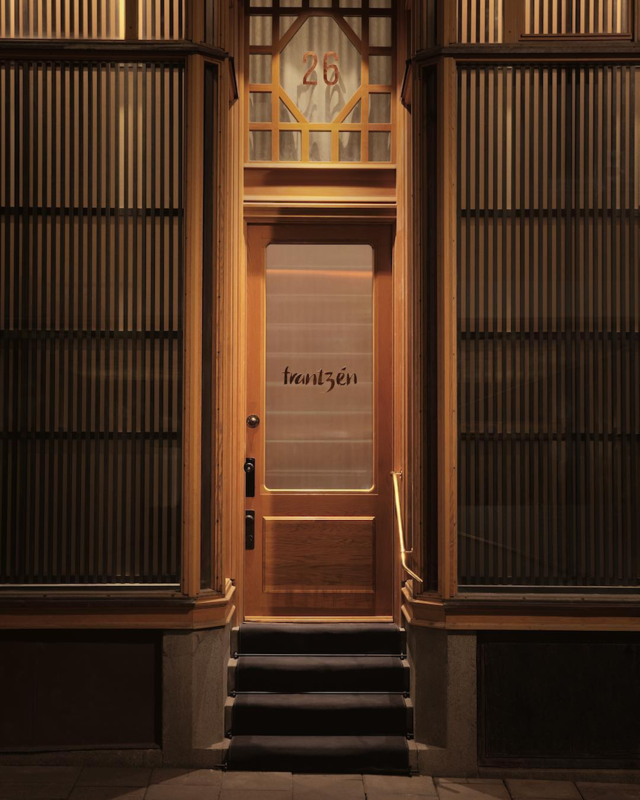 Frantzén is open for dinner Wednesday through Saturday and for lunch on Friday and Saturday. 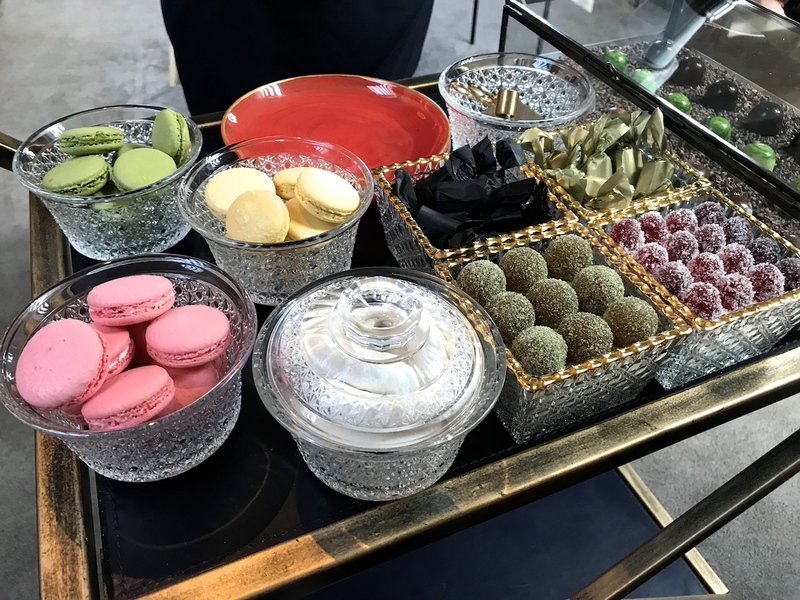 At both lunch and dinner the restaurant serves a multi-course tasting menu (around 10 courses with appetisers and sweets) which is priced at SEK 3,000 (£256). The extra space at the new location also enabled the restaurant to create a proper wine cellar (there was no room for that at the old location) and wine list, as impressive and expensive as you would expect from a three-star restaurant in Sweden. If you decide to go for the wine pairing you will be charged SEK 1,850 (£158), a steep price, but it does include some high-end wines. On the day I visited it included Corton-Charlemagne from Drouhin and Pinot Noir from Kistler. The juice pairing comes in at SEK 900 (£77). 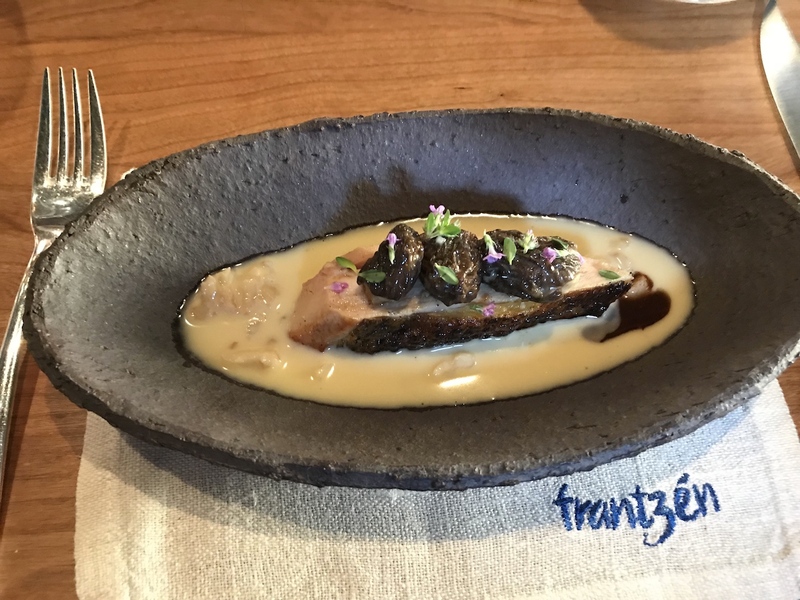 I had lunch at Frantzén in April 2018. Originally I tried to book a table online on 1 March, but Frantzén's website crashed seconds after the online bookings for April opened - apparently (as I was later told) more than 100,000 of us tried to make a booking that day. I mentioned this on Twitter to Björn Frantzén, who was then kind enough to arrange a booking. So, the restaurant knew I was coming. 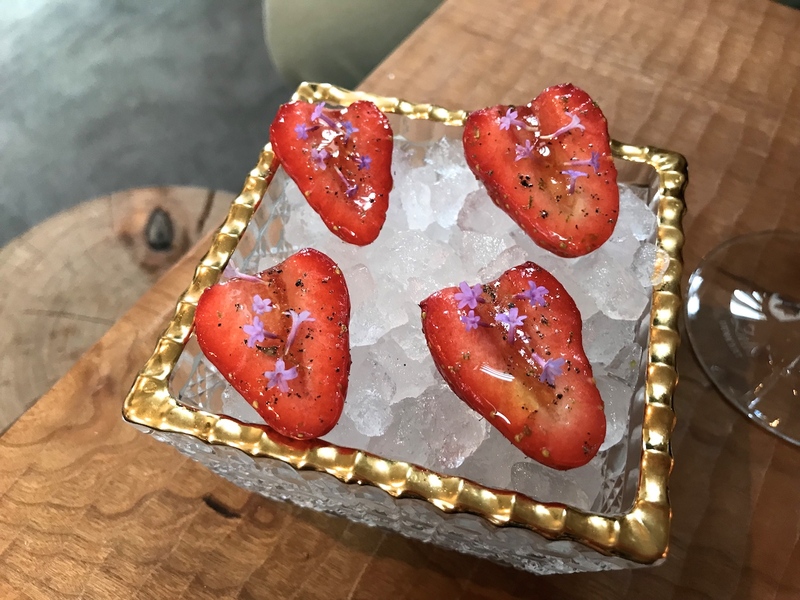 Every meal at Frantzén starts with drinks and appetisers in the lounge area located on the top floor of the restaurant, which features a working counter where the appetisers are prepared. 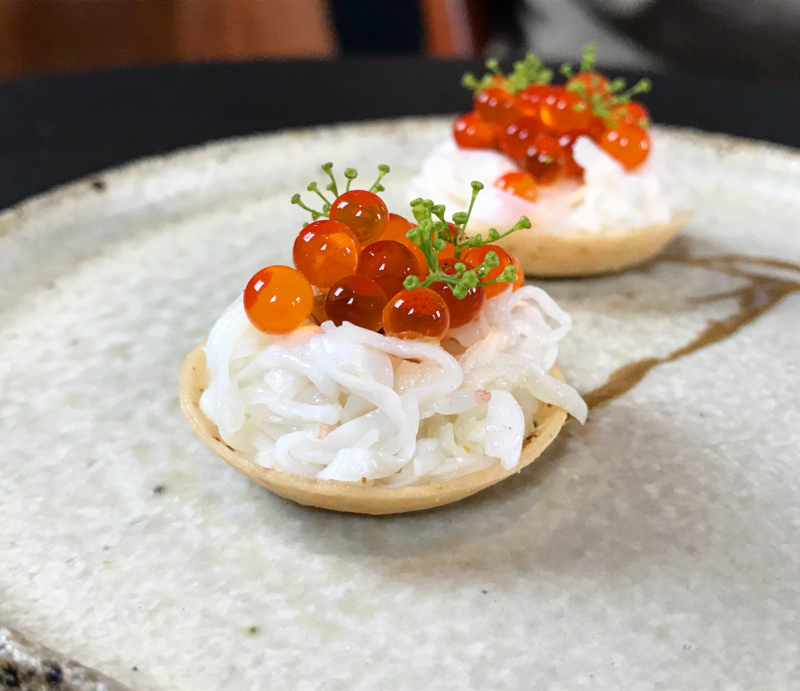 Today's appetiser selection started with a pristine crisp tartlet with a glorious filling of beer-cooked king crab meat seasoned with a touch of lemon and topped with trout roe. 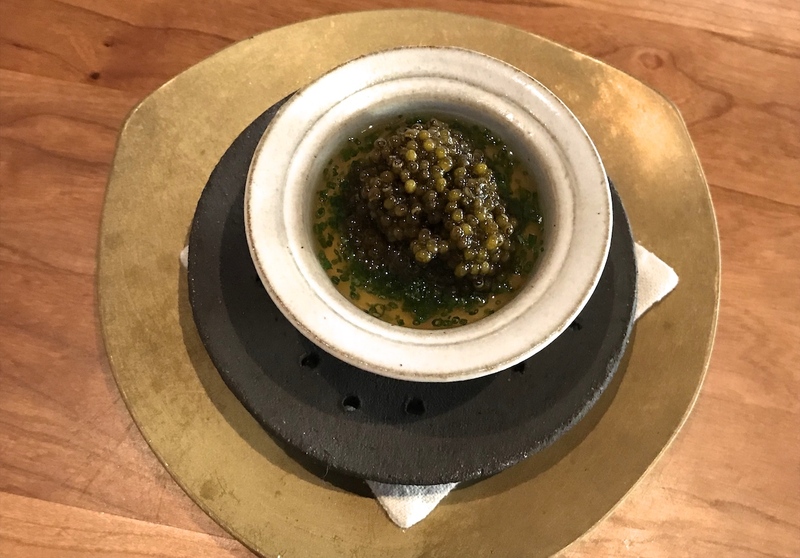 A sumptuous combination of fresh flavours, the trout roe enhancing the sweetness of the crab wonderfully. Arriving shortly after, was a light and crisp pumpkin-flavoured macaron with a filling of foie gras crème, bitter orange compote, and a thin oat crisp. Superb textures and unbelievable flavour-fireworks captured in one little bite. 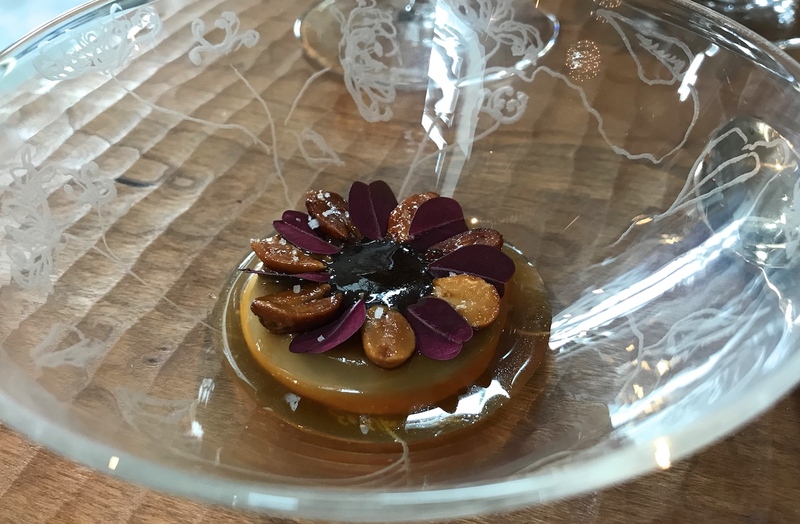 First you get the pumpkin, then the orange kicks in, followed by the richness of the foie gras, next everything blends together and finally in the aftertaste the orange returns. 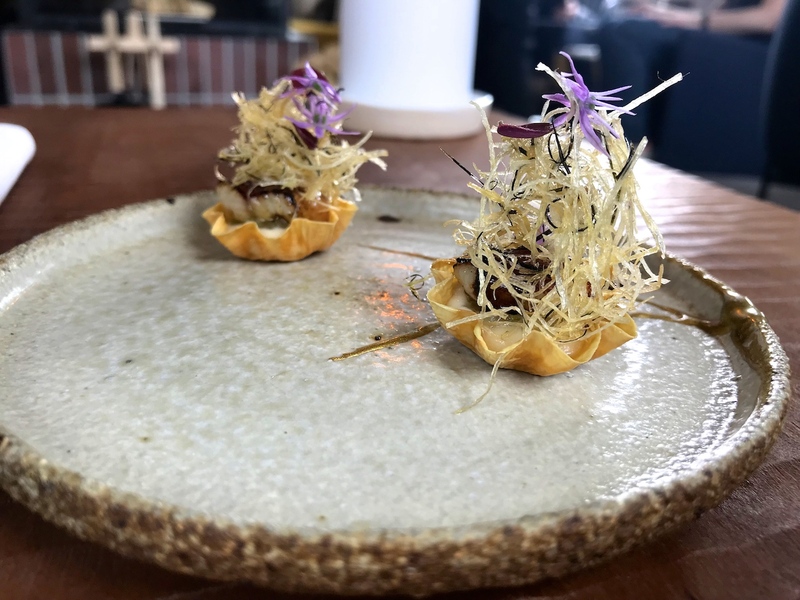 Next was a delicate little yuba skin tartlet filled with a warm and smooth cauliflower crème and topped with a piece of glazed, smoked eel and pickled cucumber. A truly exceptional bite with original and skillful use of yuba (tofu skin). Lovely, warm and precise, flavours and there was a nice touch of acidity in the finish. 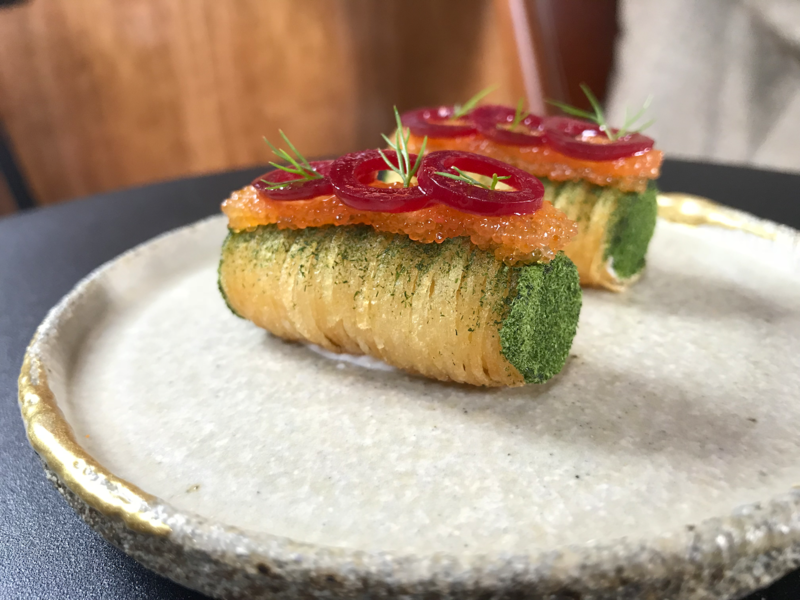 Best of all was Frantzén's take on Råraka: a visually stunning crisp potato cylinder (with a kataifi-like texture) filled with crème fraîche gently seasoned with lemon and both sides dipped in chive powder. Carefully placed on top was some Kalix vendace roe and three pickled onion rings. The superlative of sensational, if there is one. Next we were taken to the aforementioned working counter, which, as it turned out, also housed a chilled unit, which displayed today's ingredient selection. Whilst we were talked through these ingredients we enjoyed two more appetisers. 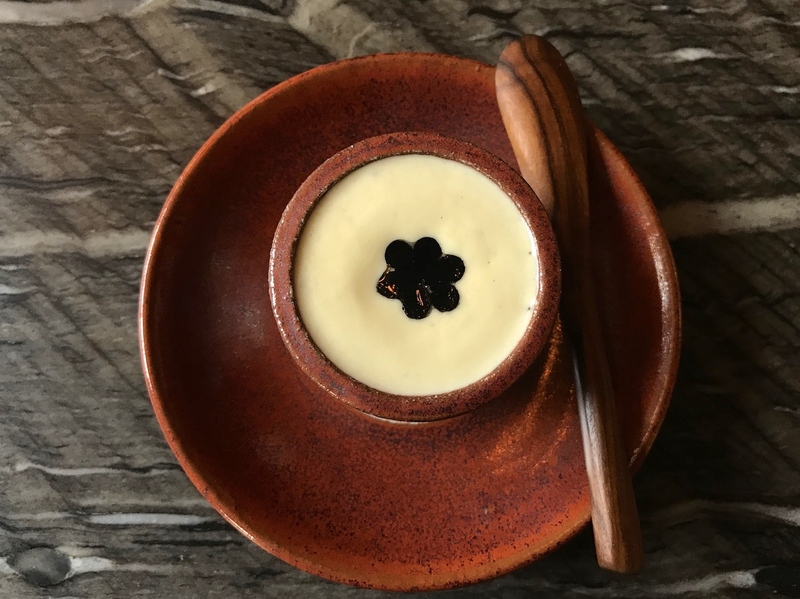 There was rich and silky artichoke and cheese soup with little crunchy pieces of kohlrabi and black truffle puree, and nicely decorated with a flower of preserved black truffle. 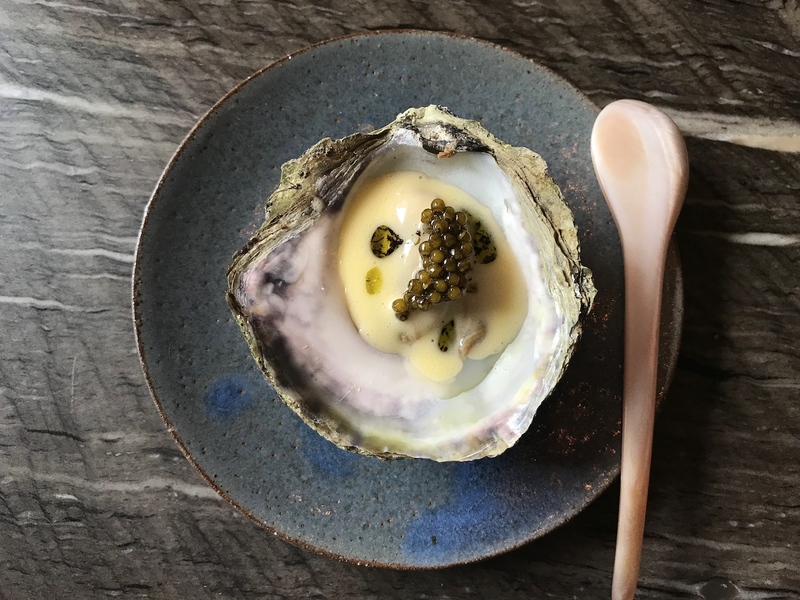 This was followed by a juicy Danish oyster covered with a pungent, fermented white asparagus Hollandaise sauce, and finished with some caviar and roasted nori oil. A pleasing, well-judged combination, the Hollandaise having a lovely long finish. Altogether a triumphant and logistically perfect curtain raiser. Producing such a high level of precision and detail on this micro scale is seriously impressive. After this relaxing start we were guided to the dining room/kitchen we were seated at the kitchen counter for the main attraction. 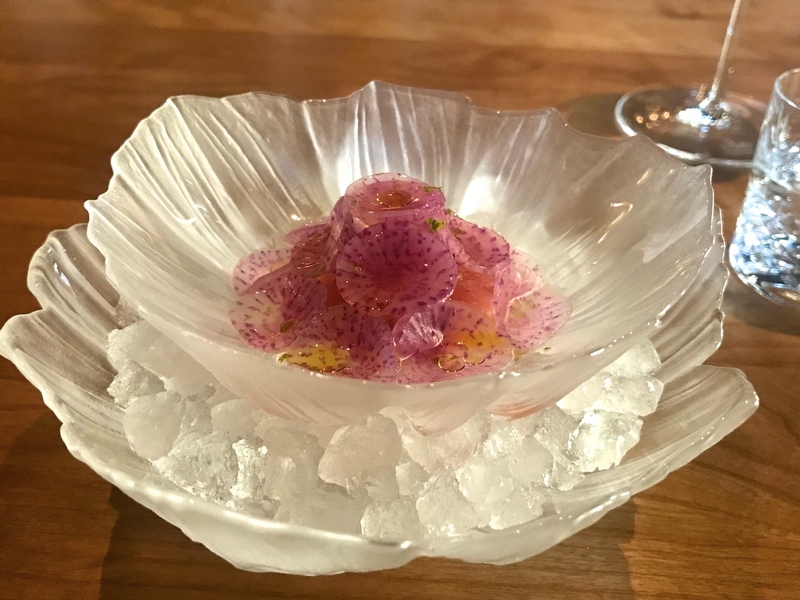 The first course of the tasting menu was a beautifully presented dish of otoro (fatty tuna, bluefin) covered with dainty purple radish cones and complemented by a dressing of salted tomato water, French olive oil, and pickled myoga (ginger root). Well-aged tuna with tender flesh and soft fat, together with the crunchy radish delivering a terrific textural contrast. The tuna had a light seasoning of lime zest, which helped to establish a Nikkei-cuisine-like flavour experience, with the tomato dressing bringing everything together. 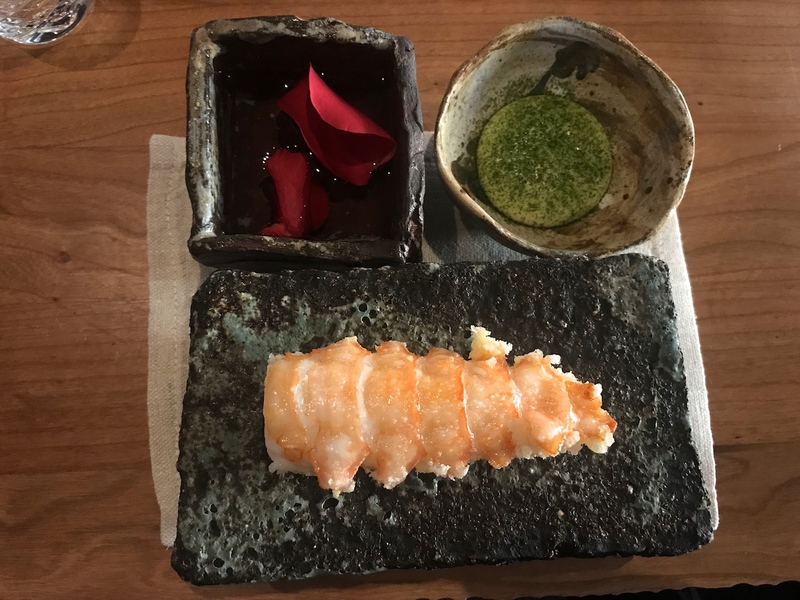 Second course was a frighteningly perfect langoustine (from Norway), flash-fried in oil, its belly having a deliciously crisp coating of koshihikari rice, dramatically served in all its glory on a black serving dish, and accompanied by a simple mayo-like dip of clarified butter infused with ginger, which was sprinkled with green onion powder. Needless to say the langoustine was marvellously juicy, releasing a wave of sweet juices with each bite. In short: Mic Drop! In the afterglow of the langoustine, the next course arrived. 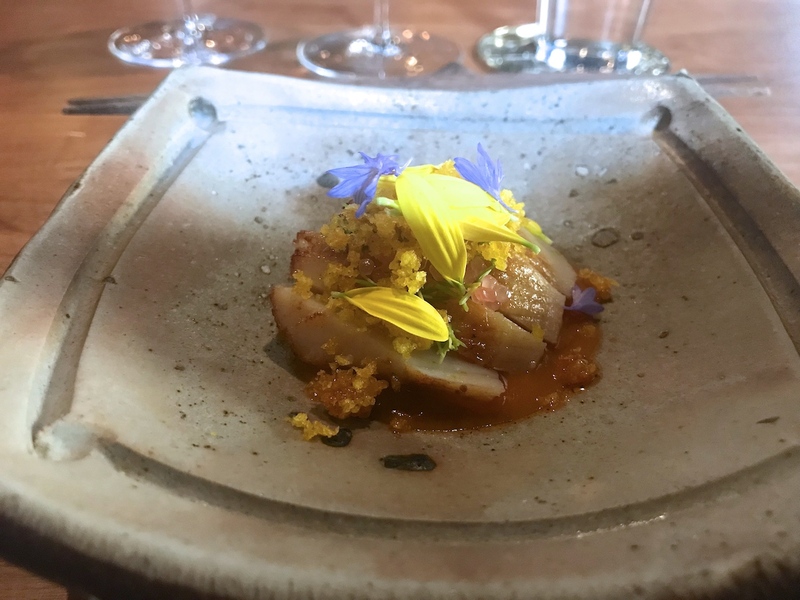 A spectacular dish of lightly roasted scallop (from Norway), sliced and served with a sea urchin hot sauce (kimchi style), and scattered with finger lime vesicles and crunchy chrysanthemum flowers (that had a crumb-like texture) and fresh chrysanthemum petals. Highly imaginative use of sea urchin, the sauce having sensitively dosed heat and a potent and distinct umaminess. Flavours were jumping off the plate. The scallop took on the sauce beautifully, the finger lime delivered nice little pops of fruity acidity, and the chrysanthemum crunch added gentle, bittersweet notes and a nice, contrasting texture. This flavour firework was followed by a more comforting and soothing dish of Chawanmushi (Japanese steamed egg custard) covered with a layer of aged pork broth seasoned with chopped chives and generously finished with Frantzen's own "Prestige Oscietra" caviar (from Rossini Caviar in Denmark), a type of caviar with a unique colour, aged for 4 months and preserved with less salt (3.5%) than regular caviar. Well-set and satisfyingly creamy chawanmushi, the pork broth adding richness and complexity, without dominating the creaminess of the chawanmushi. Offering some welcome crunch was a side dish of crisp pork skin dusted with mushroom, vinegar and seaweed powder. 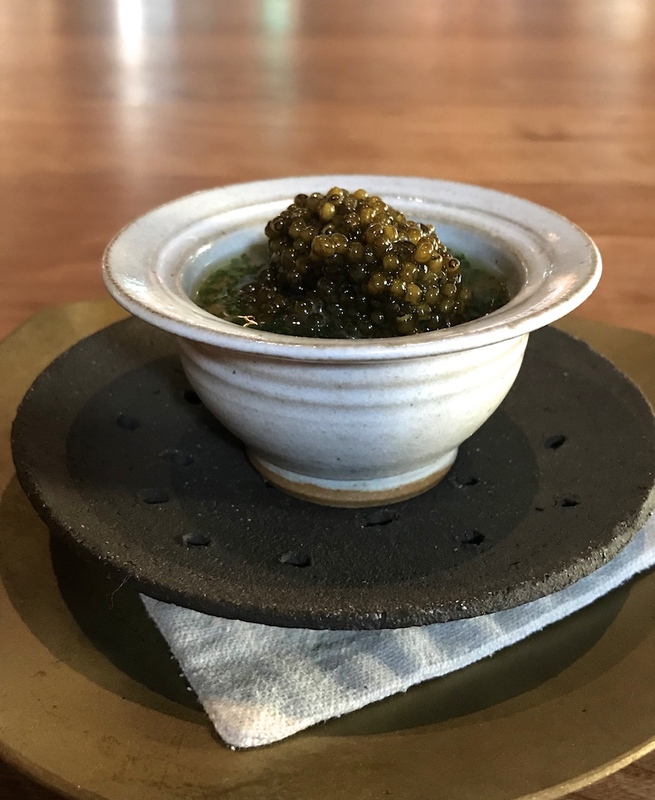 The highlight of the dish though, was the caviar, which was incredibly pure, gently dissolving in the mouth, with a wonderful mild salinity coming through and with a nice clean finish. 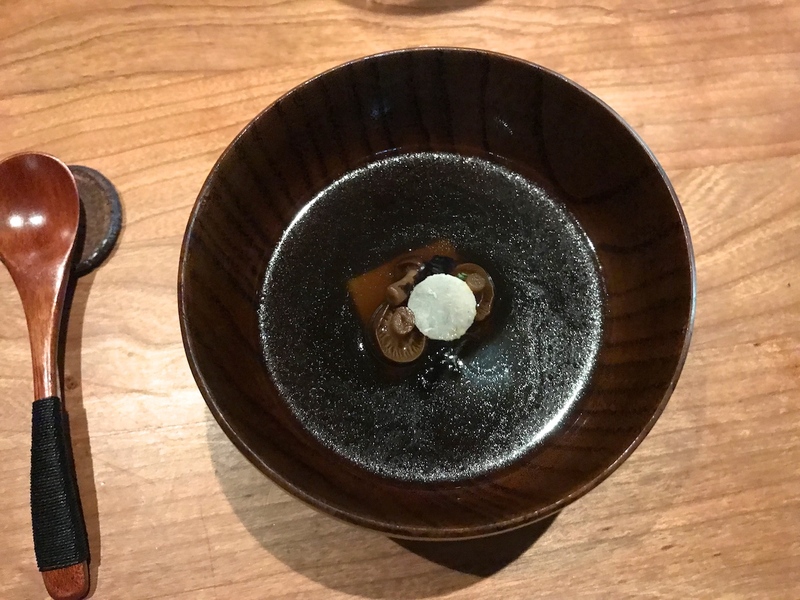 It balanced the lush richness of the chawanmushi and pork broth perfectly, but it also delivered an attractive temperature contrast, its cooling properties giving the dish finesse and elegance. On to the fifth course, superbly cooked breast of guinea fowl complemented by a dazzling Vin Jaune sauce seasoned with blond miso (from Kyoto), and browned walnut butter, and with some chopped sprouted walnuts mixed through. 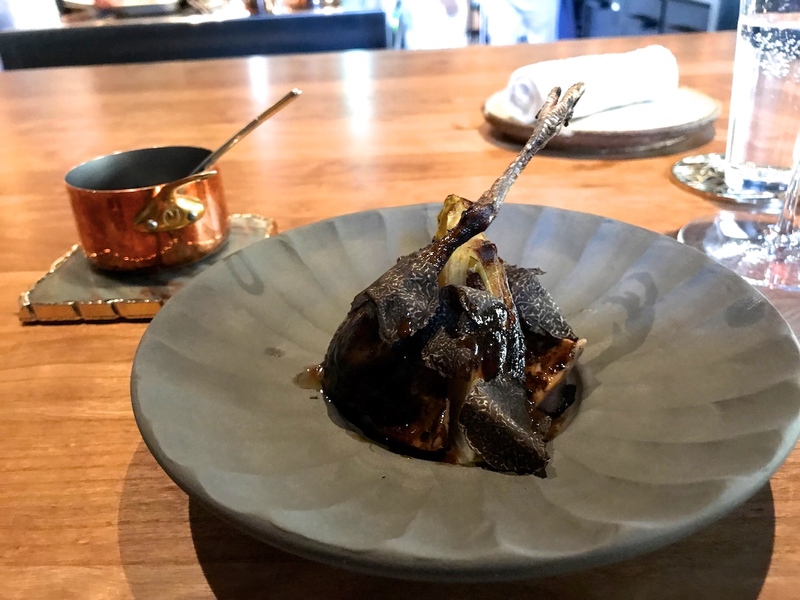 On top of the guinea fowl were three plump smoked morel mushrooms filled with a mousse made from the leg meat, garnished with lemon thyme flowers. Loved how the added smokiness intensified the natural flavour of the morel mushrooms and the lemon thyme flowers delivered subtle floral and citrus notes. An extraordinary, classically based dish infused with original modern touches delivering utter, unequivocal delight. 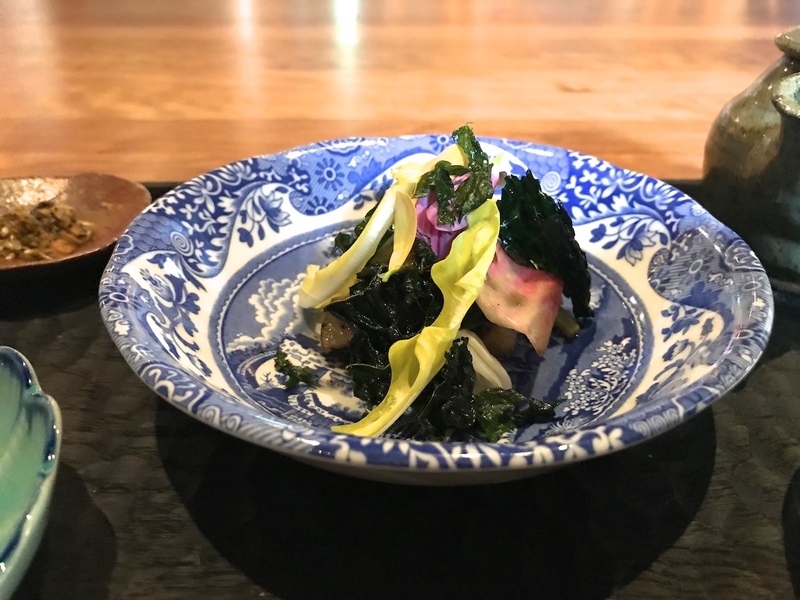 Sixth course was "Homage Satio Tempestas", as the name suggests a homage to this signature dish based on produce from Frantzén's two vegetable gardens. The dish first appeared on the menu in 2009 and past versions have contained up to 43 ingredients, often involving many different cooking techniques (think roasted, fried, pickled, steamed, pureed, dried, marinated), and often accompanied by an exact list of all the ingredients. Today's dish featured pickled and grilled spring vegetables and greens/leaves, accompanied by a whipped buttermilk crème dip topped with a mixed cress paste (prepared à la minute in a pestle and mortar), a little bowl with crunchy fish scales (lightly seasoned with sesame seeds) for extra texture and seasoning, and finally some lemon tea. I know this is totally out of character for me, but I simply can't remember all the individual ingredients, because after the first bite I simply got lost in the textures and gorgeousness of this dish. I will tell you this however: some of the vegetables had been grilled over open fire, creating an umami-effect that transformed them into comfort food. The present version is certainly less elaborate than its predecessors but it still captures the essence of the Satio Tempestas, producing comfort and sophistication in equal measure. Next on the menu was "French Toast", another Frantzén classic, on the menu since the restaurant opened in 2008. 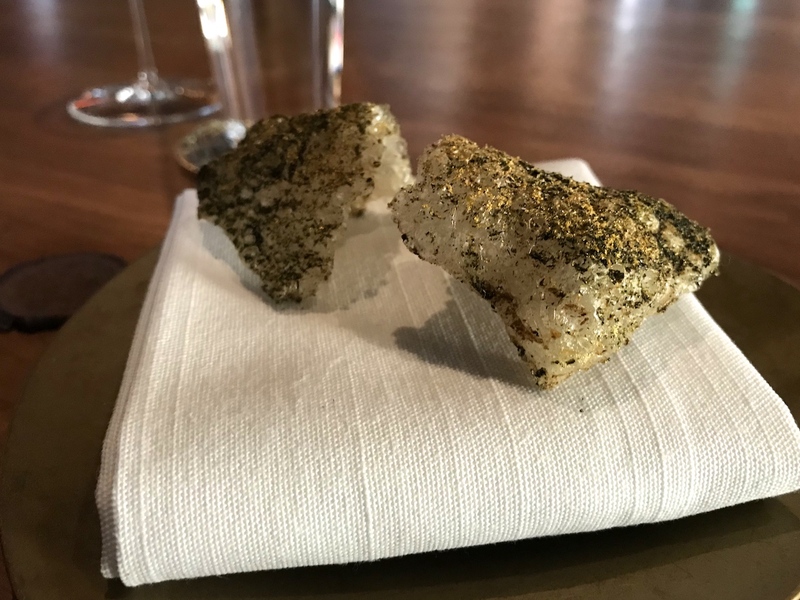 I'm glad this dish has not gone into retirement, because it was not included in the tasting menus I experienced at Frantzén in 2012 and 2014. So, this was a first for me. 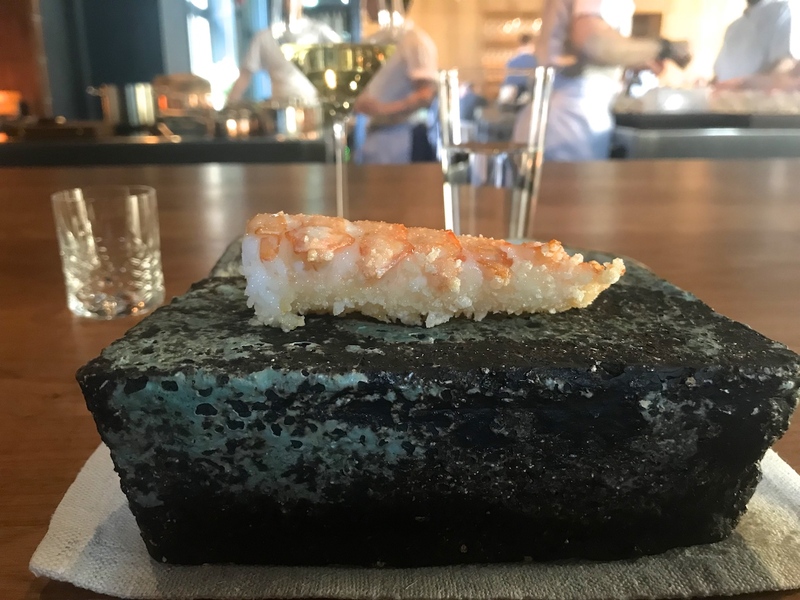 To prep our palates for this truffle, cheese and onion extravaganza, we were first served a silver onion soup with roasted onion puree and chopped toasted almonds, topped with a roasted almond foam, and finished with some almond oil. Placed in the middle of the bowl was a quenelle of whipped cream flavoured with liquorice. A pleasing combination of flavours and textures with deliciously intense, roasted onion flavours coming through and with creative and judicious use of liquorice. The liquorice enhanded the sweetness of the onion nicely, but at the same time it gave the dish a lovely savoury-sweet edge. Finally, the almond foam added a nice milky accent. But the real knockout was the French Toast, carefully assembled on the counter right in front of me. A crunchy rectangular piece of French toast is covered with immaculate, gently roasted silver onions - immaculate as in perfectly soft, uncoloured onions without a trace of bitters - and a 24-month Vacche Rosse Parmesan cream is piped on top of this. It is then garnished with a few drops of 100-year-old Balsamic vinegar, and the toast is finished with a lavish heap of thinly shaved Périgord truffle, making it possibly the most opulent and luxurious version to date. It is hard for me to think of a more glorious combination of flavours and textures. A real thing of beauty, which for the next minute or so, I was busy shoving into my face, the indiviual flavours hitting my palate over and over again. Two preparations of quail followed. First up was barbecued quail (breast and leg) with endive, pear, thinly sliced black truffle and brilliantly complemented with a Périgueux-style sauce (Madeira and truffle sauce) flavoured "à la royale" with the quail's liver and seasoned with a bit of sherry vinegar and caramelised apple, the latter lending a beautiful rich fruitiness to the sauce. Exquisite quail, served here in the most beautiful fashion, the barbecuing adding an attractive caramelisation and lovely, subtle, smoky flavours. The luxurious sauce, however, elevated this dish to a lofty level of excellence. And look, they left a little copper sauce pan with this hauntingly divine nectar next to my plate on the counter. 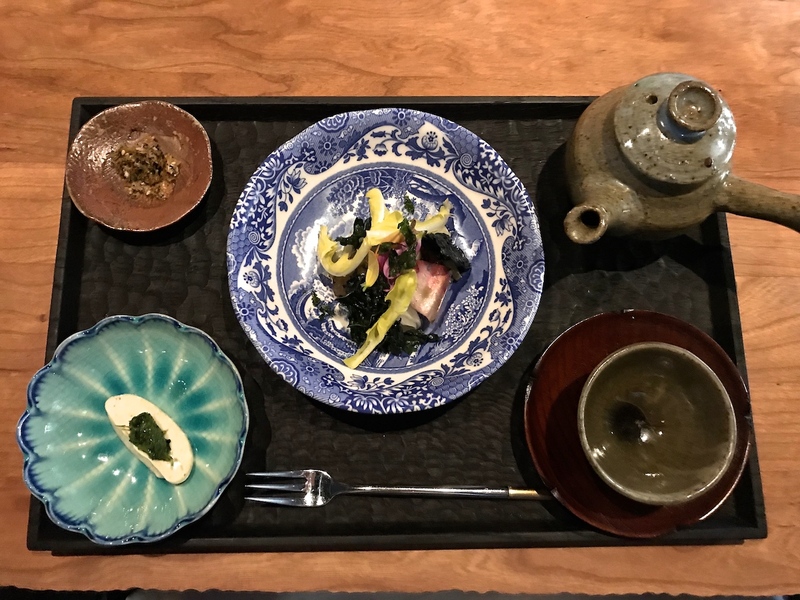 The second preparation was a wonderfully intense, fermented mushroom and grilled quail "tea", served with a piece of truffled tofu, sliced water chestnut, and pickled mushrooms. Last course was a dessert called "tea, milk and honey". 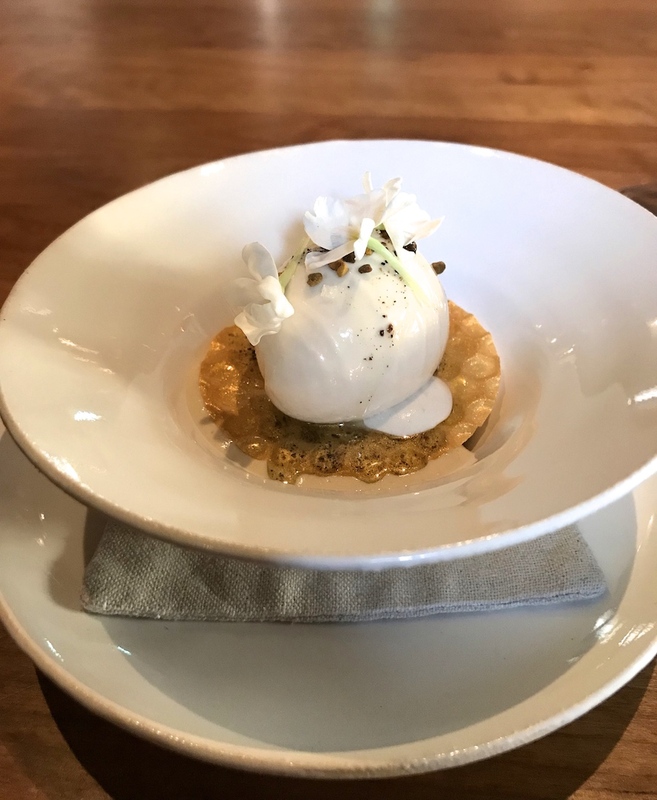 At the bottom of the bowl was some crumble with an Earl Grey tea crème, covered with a crisp yuba skin disc that had a honeycomb pattern, and on top of this was a sour milk ice cream garnished with bee pollen, bergamot oil and verbena flowers. A delicately balanced dessert, each flavour shining on its own, particularly the tea crème which provided complexity and lovely bitters, but everything combined created a wonderful synergy. Delightful textures too. Coffee was enjoyed back in the lounge, accompanied by a number of absolutely outstanding sweet treats. Highlights being "snickers" a sublime flavour marriage of foie gras caramel crème with salted peanuts and oxalis leaves; fresh Gariguette strawberries "seasoned" with chamomile and tellicherry pepper (a type of black pepper), and a ridiciously gorgeous Charentais melon sorbet, seasoned with a drizzle of Spanish olive oil and Vin Jaune. Beautifully distinct and concentrated melon flavours; it was like eating a melon concentrate. It was in December 2012 when Björn Frantzén first dazzled me with his cooking and he outperformed that experience in February 2014. Yes, it's no secret that I've been a fan of this restaurant for years. Fine dining is an evolving institution that can be moulded to suit, and since the early days Björn Frantzén has always had a modern and innovative approach, always tweaking and tinkering the restaurant experience, trying to erase the border between the kitchen and the dining room as much as possible in the process. 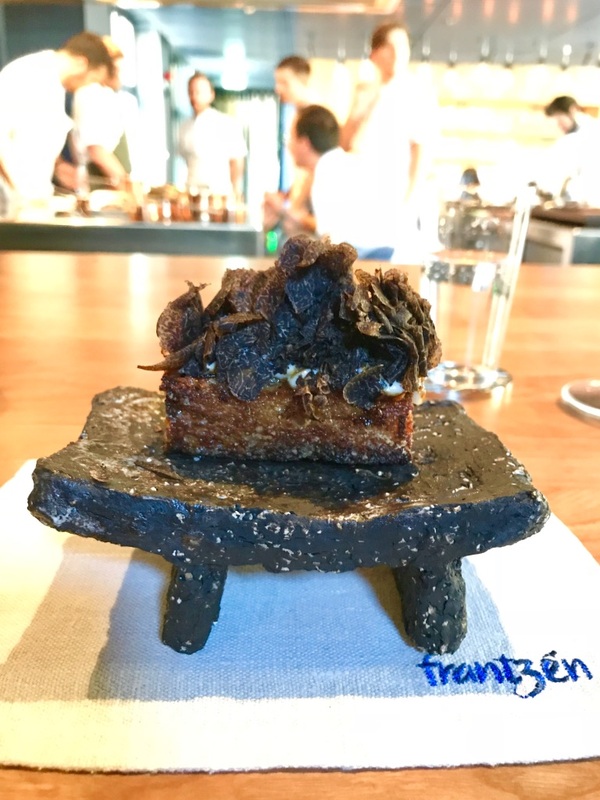 At this new location Frantzén has created one hell of a restaurant, offering a unique and intimate dining experience with a thoroughly enjoyable and relaxed interaction between the chefs, the service staff (led by the very experienced Carl Frosterud) and the guests. 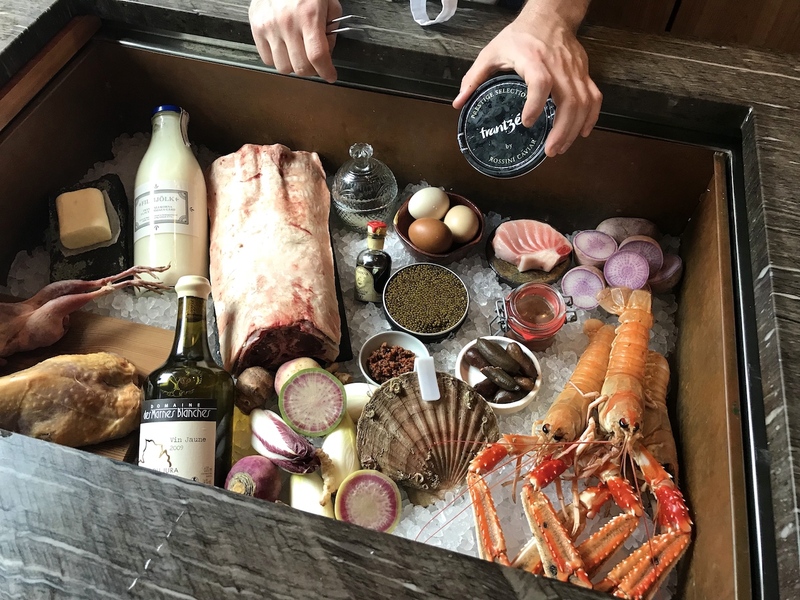 Björn Frantzén has had a lifelong passion and healthy obsession with finding the best produce, local, regional or further afield, and he's continually trying to find the best possible treatment for his ingredients, and above all he is a master of showcasing ingredients in their most splendid way. This has always resulted in world-class food, but today it was nothing short of magic, in a way eclipsing my previous meals. 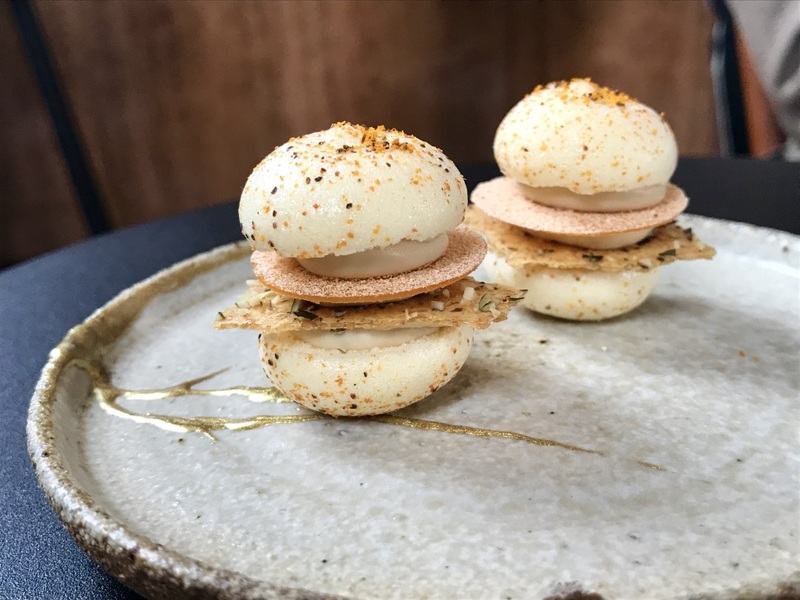 The kitchen team, currently lead by head chef Marcus Jernmark, produced a string of masterpieces, some influenced by the minimalist Japanese style, others laced with voluptuousness, and including a few more classically based dishes paired with perfectly sculptured sauces. Exceptionally tailored dishes with some of the finest ingredients the world has to offer. The meal to end all meals.